Before you know more about this technology, it is better that you go through the basics of 3-D TV. To know more about it click on the link below. Parallax barrier is an autostereoscopic type of display. That is, there is no need of any special accessories to watch a 3-D image. The TV will be fully equipped so that you can watch the 3-D image with your bare eyes. Out of all the autostereoscopic TV’s available, this is the only one which can be used for viewing both 2-D and 3-D images in one display. This technology has become so famous that major companies like SONY, SHARP, and LG have started making Parallax Barrier implemented TV’s. 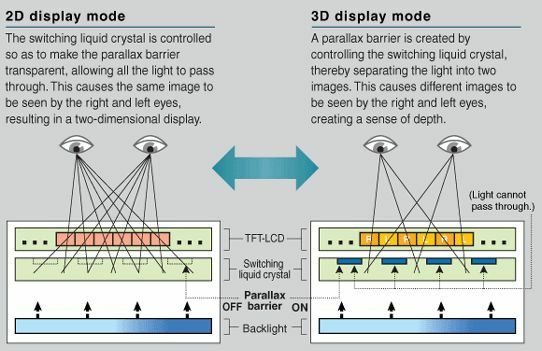 Parallax Barrier is mainly a small crate of liquid crystals of liquid displays that is placed right in fron of a 2-D screen. The crate may have slits at regular intervals and is placed at special pixel columns of the TFT screen. Thus alternating images will be sent to each eye of the viewer. But for the images to be received by the person, he must sit at a certain angle from the TV called the sweet spot. When the input voltage is given to the parallax barrier, the slits present at intervals will cut the light into two and will be sent to the right and left eye. Both these lights will be different in nature. These two lights will be joined together by the brain to provide a virtual 3-D image. To know the exact working of this technology, click on the link below. In TV’s having this technology, the remote is coped up with an easy button which easily switches ON and OFF the parallax barrier. Thus, if the parallax barrier is switched ON, the TV will be in 3-D mode. That is, it can be used for viewing 3-D images. If the parallax barrier is OFF, the TV can be viewed in 2-D mode. That is, the TV becomes a regular one. As this is the simplest method, it can be applicable in computer screens as well. You can play 3-D games and turn it to 2-D mode for working as well. The major disadvantage with this method is that you will have to sit at certain angles called sweet spots to get the best view. If you sit away from the prescribed angle, the TV appears to be blurred. Thus the total number of viewers for watching a programme in such a TV will be restricted.